During The Binding Of Isaac’s introduction, God speaks to Isaac’s mother three times. With each message, he warns her that Isaac has been corrupted by sin and needs to be cloistered away from evil influences if he stands a chance at salvation. The first time God gives her these instructions, she takes away Isaac’s toys and clothes. The second time, she locks him in his room, naked and alone. The third time, God tells her that the only way to save Isaac is to kill him. God, the ultimate moral authority, is a voice without a body. Isaac, supposedly sinful and corrupt, has nothing but a body. Looking for a place to hide from his mother, Isaac finds a trap door and heads into the basement below. The descent always begins this way, but from there, all the rooms, tools, and power-ups Isaac finds as he fights through the basement—and whatever lies beyond it—are pulled at random from an enormous pool of possibilities. One thing never changes in this twisted world, though: Down here, the human body is evil incarnate. The monsters that wait below the trap door are all the more hideous for how human they are. They’re ambling decapitated corpses. They’re children whose heads are swollen with maggots and flies. They’re snakes and spiders with human faces. Fighting is carried out with weaponized bodily functions—first tears and then vomit, urine, and blood. Even the landscape of the basement is littered with human waste, and the unlockable bonus levels take place inside the body of Isaac’s mother. The most contentious body of all, though, is Isaac’s. It’s a battlefield, and as he descends further into the basement, it reveals more about his relationship with himself, his mother, and his God. Every power-up that Isaac collects during his trek has both a utilitarian and superficial effect. The Chemical Peel increases the power of Isaac’s every other shot, but it also leaves the left half of his face hideously burned. Stigmata boosts Isaac’s health and damage output but causes him to bleed from the eyes. These mutations accumulate, so collecting both the Chemical Peel and the Stigmata will leave Isaac a burn victim crying blood. At the start of every new game, Isaac is as naked and pristine as a newborn baby, but by the time he is powerful enough to escape the basement, he has become warped by several floors’ worth of compounded mutilations. Isaac recognizes that human bodies are inherently sinful, and this self-flagellation is what gives him the power to fight back against the basement’s body horrors. After all, if God Himself decrees that only death can save him from sin, surely self-harm of this sort must lend him a fraction of the power he needs to fight back against bodily corruption. So if Isaac’s foot causes him to stumble, he cuts it off; if his eye causes him to stumble, he tears it out (literally, as a power-up called The Peeper causes Isaac’s eye to pop out of its socket and go bouncing around the room). Some of Isaac’s potential wounds, though, invoke marks left by his unfit mother. The Breakfast and Dinner items Isaac can find are a carton of spoiled milk and a can of dog food, respectively, and the Belt and Wooden Spoon allude to past beatings. Other items will leave Isaac the picture of child abuse: malnourished, black-eyed, and spitting teeth. 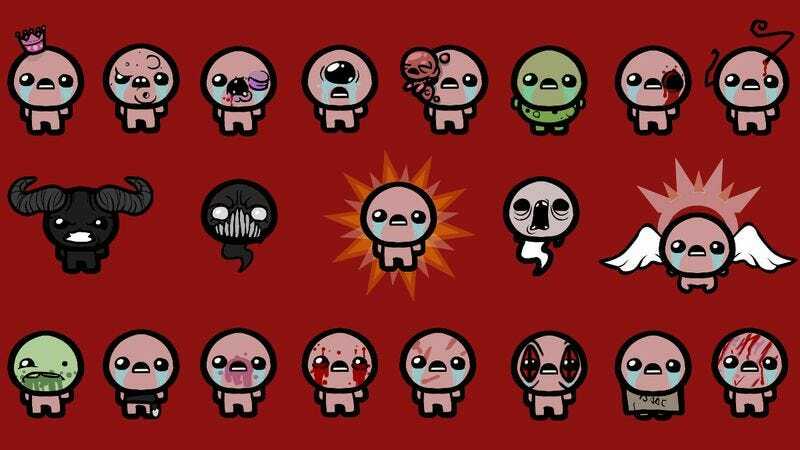 Although all of Isaac’s wounds are self-inflicted, collecting these power-ups turns his body into an image of parental violence, and reveals that his relationship with his mother was tragic long before she began hearing voices. There is a third party that leaves its mark on Isaac’s body too: Satan. Every time Isaac defeats a boss, there is a chance that a Devil Room will appear and give him the opportunity to trade some of his life for powerful items that cause particularly grisly mutations. Brimstone is a fan favorite—it exchanges Isaac’s tears with a powerful jet stream of vomited blood and gives him a pair of gnarly demonic horns. Most of the basement’s power-ups allow Isaac to fight back against bodily corruption by punishing his own body, but the items of the Devil Room give him a chance to give in to that corruption, to embrace that evil and the power that comes with it. As he battles his way through the basement, Isaac is slowly warped into a hideous ghoul, becoming more powerful and more frightening with every injury he inflicts on himself, every recreation of his mother’s abuse, every blood pact with the Devil. It’s no surprise, then, that three of the game’s possible final confrontations are with Mom, Satan, and Isaac himself—the same parties that have been fighting for dominion over Isaac’s body. Squaring off against these forces is Isaac’s chance to regain control. Empowered by her mistreatment, Isaac defeats his mother and triumphs over a history of neglect and abuse. By defeating Satan, he rejects the notion that bodies are inherently evil, an idea the devil perpetuates but was originally taught to Isaac by God. When he defeats his pristine past self, he takes control of his future, letting go of the unblemished child he used to be and accepting that while he might be damaged, he is also strong. Isaac’s body is a tiny canvas that he uses to paint an increasingly gruesome picture of neglect and abuse. It stands around 30 pixels high on the screen, but over the course of a single run, it becomes a complex portrait of self-destruction, familial violence, and religious fanaticism. No two trips through the basement will produce the same image; all they will have in common is how they start and how they end. No matter which of the potential final bosses Isaac confronts, the game’s endings all depict him as he was at the very beginning. Victory washes away his injuries and mutations, and Isaac’s body is once again his own. The canvas is blank again, but this time he can paint over it with whatever he wants.